The Rants and Raves had a great month last night with almost 5,000 unique visitors. That’s a huge boost compared to what I’m accustomed to. This is due largely in part by my promoting the site through social networks like Digg, Facebook, Stumbleupon, etc. In promoting the site by writing articles I know will garner large amounts of traffic I haven’t been writing about the things I really enjoy and love. I’m going to cut a lot of fat from the site’s content and get down to the meat of what I like to talk about. 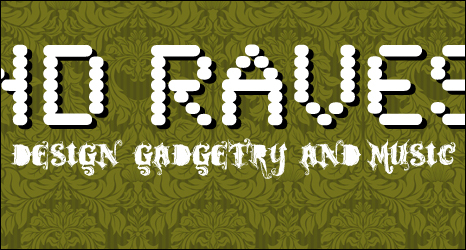 Design, gadgetry, and music production. I’m a graphic designer so that’s a given. Anything I can get my hands on to create something I will play with for countless hours on end. I love any new kind of gadget out there. Probably closely related to my love of design…Apple, Wacom, Sony, etc…I’m a fan of innovative designs and concepts that I can use to further my use of technology and the internet. And I consider myself an amateur at-home musician. I love to mix, record, collect, and write music. So expect to see less posts on world news and politics and all that other crap…I’ll let other sites talk about that. Do expect to see posts related to advertising, design, music, gadgets, and the occasional rant or rave about traffic or some other humorous bit. I know the changes will probably lower traffic through here but I’m ok with that. It’s not about that, it’s about enjoying my own content and loving what I write about.